Since we're in the midst of prerelease season for Guilds of Ravnica, I've been doing the same things that you probably are: inhaling preview cards on the Intarwebs, reading through set descriptions and reviews, and trying to figure out which guild you're going to play or which card you really want to open (note: it's Assassin's Trophy...that card is gas, kids). Since one of the first things that we got from previews of Guilds is a description of the new mechanics that each guild gets to play with, the mechanic that has created the most buzz is Surveil. Maybe because we have the new Snapcaster Mage in Mission Briefing or because it does such an efficient job of smoothing out your draws, everyone is fired up about it. But how does it compare to mechanics that also smooth out draws and let you find what you need: Scry and Explore? Fortunately, Wizards has included a few pairs of cards that we can compare to one another and determine how strong the card designers think they are. Here's the approach: if we were going to compare two (fake) mechanics, like "Floss" and "Dab", we could look for relatively similar abilities and converted mana costs, then compare them to determine what you got for your money. In the simplest case, let's say we have a 1/1 for 1 CMC that is "Floss 3", and another 1/1 for 1 CMC at the same rarity that is "Dab 1". 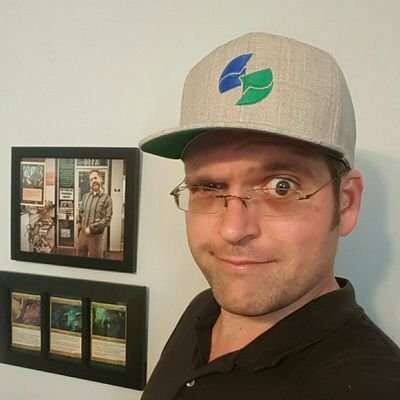 Logically, we would have to conclude that the designers (who will generally want cards with equal CMC, equal rarity, and equal power and toughness to be equally strong UNLESS they have ulterior motives like wanting to encourage players to use new mechanics more than older ones or are just attempting to make a "bad" card) believe that dabbing once is worth about the same as flossing three times. (Note: I'll take "Sentences I Never Thought I'd Write In My Lifetime" for $1000, Alex.) We also need to generally understand that this technique doesn't work in every format, because sets are created with different power levels at different times for different reasons, and even THEN mistakes are made and overpowered mechanics/sets can dominate eras in a way that's difficult to quantify in pure comparison...looking at you, Affinity/Infect. Every set has to have one expensive sphinx that control decks can use as a finisher in Limited. I think Richard Garfield wrote that as the Twelfth Commandment of Card Design. Or something. But anyway, two big sphinges in Standard give us a way to compare the perceived value of Surveil versus the old standby, Scry. Both cards are the same creature type. Both give you seven combined power and toughness (yes, a 4/3 may be better than a 3/4 depending on how the format shakes out, but for now we'll compare these as essentially equal). Both have flying. Dream Eater costs an additional blue mana, but for that you get flash which might explain the discrepency ...flash creatures often work as quasi-removal spells that blue doesn't otherwise get through combat. So, for approximately the same creature, you get Surveil 4 as compared to Scry 2. So...the designers think Scry is twice as valuable as Surveil? No chance. 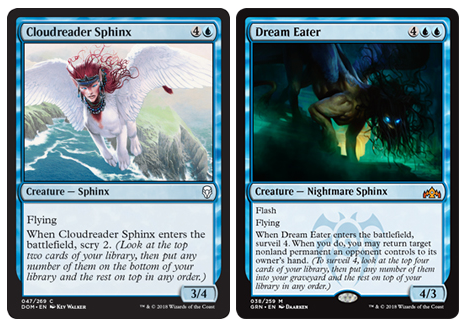 See, Dream Eater is the blue MYTHIC in GRV, and Cloudreader Sphinx is a COMMON. So...think about that for a second. A designer takes a common in a previous set, adds one CMC, flash, and replaces Scry with Surveil, and it becomes MYTHIC. That's a huge difference. If you had read about the mechanic and realized that there's power with not only arranging the top of your deck but also putting cards into your graveyard as opposed to the bottom of your library (essentially out of reach since there are very few playable tutors in Standard at this moment), you know immediately that Surveil is strong, pushed, or both. Now let's compare Surveil to one of the deck-manipulation mechanics that will remain in Standard because of Ixalan: Explore. Explore is relatively similar to Surveil insofar as you get to choose whether to put a card on top of your library or into your graveyard, but only if it's a non-land. If it's a land, it goes directly into your hand. You also get a +1/+1 counter on the creature if it's a nonland card, which "makes up" for the card you don't get to draw (not exactly, but you get the idea). So how do these compare to one another? Both Nightveil Sprite and Siren Lookout are small, 1/2 flyers. 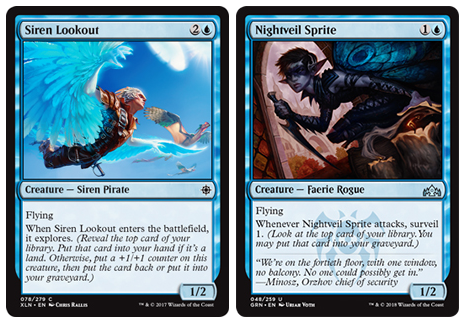 The Lookout costs one mana more and is of a more relevant creature type than the Sprite, since there is the possibility of a Pirate tribal deck but not a Faerie tribal. The Sprite is one generic mana cheaper, but its status as an uncommon versus a common can explain the mana cost. So, again, we have two relatively similar cards with the only difference being that one has Explore, and one has Surveil. In this case, it seems that WotC thinks that these mechanics are RELATIVELY similar in value when placed on a creature, which again makes a lot of sense. Both let you manipulate the top of your deck, and both allow you to put things you want into your graveyard. Surveil doesn't have the possibility of drawing a land for free or putting a counter on a creature, but there are now many more cards that are graveyard-dependent entering Standard. Ixalan was not a huge graveyard set, at least in Standard. There were even powerful cards that cared about your graveyard introduced into Standard through Dominaria and Core 2019 like Whisper, Blood Liturgist, Isareth the Awakener, and Muldrotha, the Gravetide (all of which deserve a second look in Standard in the new meta, but that's another article). None made much of an impact. So what do we think we know? First, we easily can tell that Wizards thinks that Surveil is at minimum significantly better than Scry, and at least on par with Explore. And since we know that there are many cards in the new Standard that are graveyard-matters cards (along with an entire SECOND mechanic (Undergrowth) that is purely a graveyard-matters mechanic and a THRID partial-graveyard mechanic in Jump-Start), it's safe to say that Surveil has the potential to do a lot of damage in the new meta. A lot of people have surmised this, but these examples help to put some flesh on the bones of the idea before prerelease. There's an important corollary to this concept as well, and that related to the other mechanic that puts cards in your graveyard: Explore. If Surveil takes off, there's an opportunity for you to try overlooked cards with Explore from Ixalan that can put cards into your graveyard AND draw lands or pump up your crew. In fact, cards like Deadeye Tracker and Jadelight Ranger have started to slowly tick up in value after hitting a relative bottom in price, so you might want to pick these up if you think this is a style of play you want to build around. There are even a couple of hidden gems that have the potential to be very good in a graveyard meta that have seen zero play. My cannon-shot-in-the-dark here is Tomb Robber: a creature with evasion that can be mentored to avoid Goblin Chainwhirler and has discard-on-a-stick along with Explore? Might be worth a shot. So go fill your graveyards with Surveil, bring stuff back from those graveyards, and go to town. From the data that we see before play even starts, I think it's going to be worth your time.